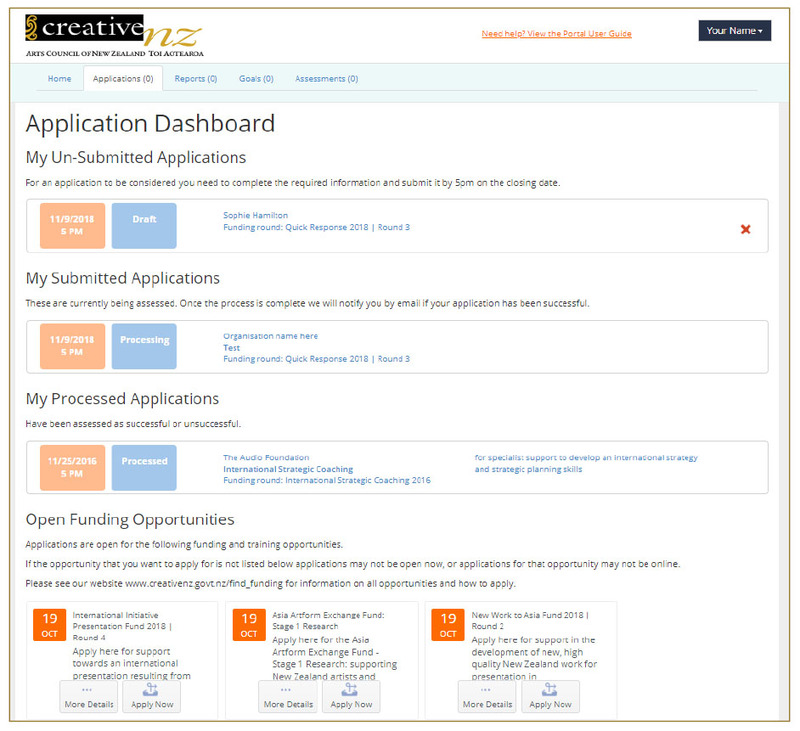 The Application Dashboard lets you manage your applications and view the funding and training opportunities that are currently open for online applications. To access the Application Dashboard click on ‘View Applications’ from your home dashboard. My un-submitted applications: these are draft applications that you haven't submitted to Creative New Zealand. Click on an application to open it and continue editing. Click X to delete any draft applications that you do not want to keep. My submitted applications: these applications have been submitted and are currently being processed by Creative New Zealand. Click on an application to view the submitted information. You cannot edit or delete an application after it has been submitted. My processed applications: these applications have been processed by Creative New Zealand. You will be notified of the outcome by email. Click on an application to view the submitted information. You cannot edit or delete a processed application. Open funding opportunities: these funding and training opportunities are currently open for online applications. Generally online applications will open between one and two months prior to the closing date. You can see the full list of opportunities and the next closing date for each on our website www.creativenz.govt.nz/findfunding. Open opportunities appear in order of the closing date for applications, which is 5:00 pm NZ time on the date in the orange box. To find out more about any of the open opportunities, including the eligibility criteria, click 'More Details'. You should check that you are eligible to apply for an opportunity before clicking 'Apply Now' to create a new application.